I've fallen a bit behind in my 150 Canadian Women QAL, at Next Step Quilt Designs, but I'm catching back up. 55-Adelaide Hunter Hoodless, helped organize Canada's first YWCA conference, which resonates with me, since one of my first part-time jobs was teaching swimming at the YMCA; she was also instrumental in getting Home Economics included as part of the school curriculum; 56-Helen MacMurchy, a doctor, her belief in preserving the White Race through the use of eugenics have me more than a bit upset; she did a lot for women's issues, yet this is clouded by her actions that led to the wrongful sterilization of many immigrants; therefore I think the light and dark of the chevrons is a good depiction of the positive and negative sides of this woman; 57-Gabrielle Roy, French Canadian author, teacher; I studied "La Petite Poule d'Eau" in university, which is why I chose the chicken coop-like fabric for the HSTs. She wrote about immigrants, the poor and underprivileged and was fluent in both English and French. Interesting in that block 55 was pieced they day before we left Florida, and then the next two were here. What is the little chevron strip? Well, I could not toss the trimmed triangles from the corner-square method to make the flying geese in block 56, so I just cut off the dog ears, and then sewed them back together as leader/enders and will use them perhaps on the back of the quilt. Leanne at Devoted Quilter put out a call for 10.5" blocks to help her make 21 quilts for seniors whose residence was entirely destroyed during a fire a week ago. They all got out safely, but lost everything. Partly to fulfill the RSC colour of the month which is multi-coloured, as well, I dug through my scraps, which took longer, seeing as I had to find some, then find the bins they belong in, since they got compressed for the move. Story of my life these days. Something simple and quick takes hours. I made her 10, 6 feminine ones and 4 masculine. I was tickled to find the taxi cabs, leftovers from a hobo bag I made after a trip to NYC in 2007 for an English Teachers' Conference. Glad to have had enough of that Kaffe one, and the Union Jacks too! Fun! Leanne needs over 800 blocks, so be sure to head over and check out her post, and how you can help. I see now that she doesn't need any more new donations of blocks, but still could use batting and backing donations. We've been watching this beauty unfurl her blossoms as we walk the Greenway over the past couple of weeks. AMulberry is my guess. We set out three various bird feeders, this one of niger seed. Although they don't eat it, the cardinals found it before the goldfinches. Gosh, the males are so brilliant! and wave at Julie on the other side, and beyond her, Tish! 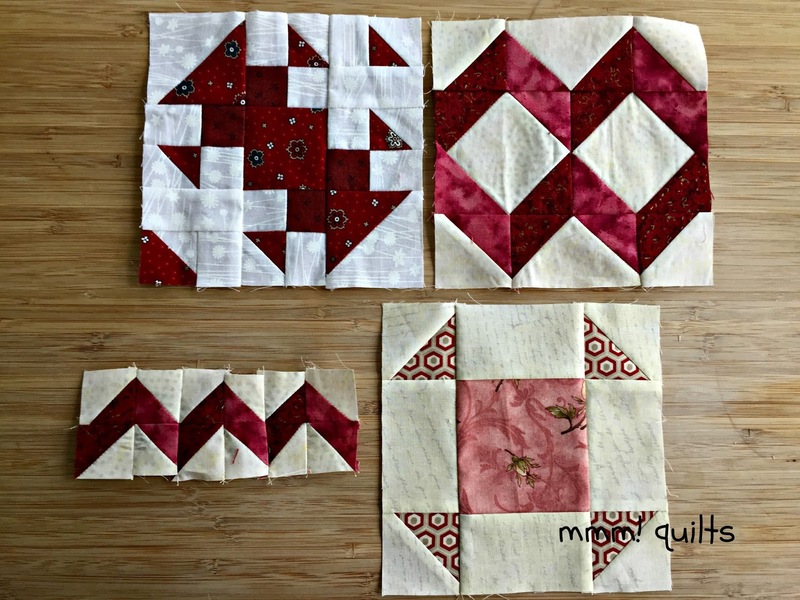 Be sure to check out the Freefall QAL Step 3 instructions where we piece the 6 leaves that float on background fabric, as well as make the blocks for the large shadow leaf point. A link up for this step will be on Monday, April 24. How amazing is the response that Leanne received in her request for blocks? I am so glad to see so many people contribute and I imagine the quilts are going to be lovely. Great use for your multi-color scraps. We don't have cardinals in Idaho, so when I saw my first one in Arizona I was tickled! SO pretty. I still need to start sewing my leaf blocks. They are all cut out, except for the paper piecing portions. That is snagging me up. Silly brain of mine . . . . I really enjoy your Canadian sampler blocks - the quilt will be stunning. How cool is the cardinal? Beautiful view of the lake. Beauty surrounds you from the cardinals to your lovely 150 CW blocks. My Canadian Blocks have taken a back seat, so far back they might even be waiting outside the door!!! However, the freefall leaves are coming along nicely. Love the lake view, what a glorious place to be. I love the deep burgundy in the blocks, and I lover reading about the women even more. No 56 reminds me that no one is all black or all white, we are all just different shades of grey. 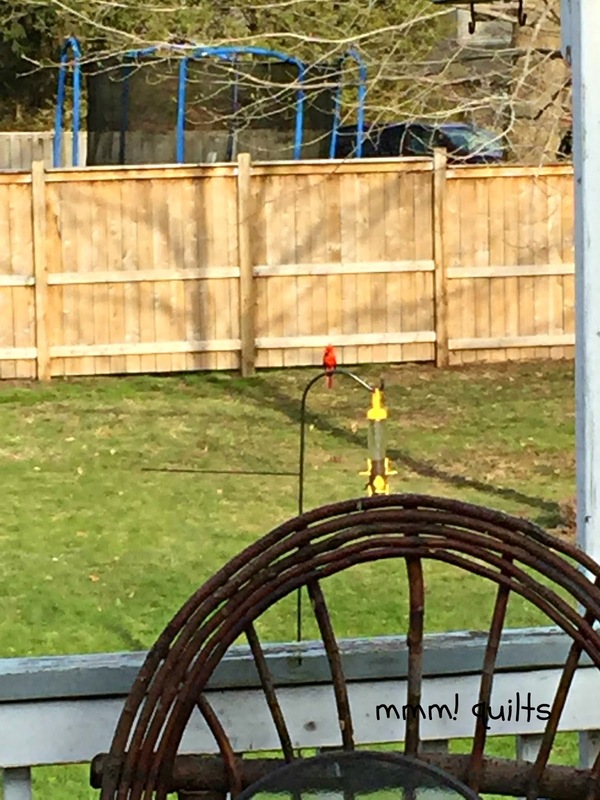 I only saw one red cardinal while visiting in Vermont last week but it was a treat. Such pretty birds!! I was admiring a very handsome Cardinal today. They are so pretty. Last year I read a novel by Jodi Piccoult called Second Glance. Prior to reading that, I had been blissfully unaware of the eugenics movement here in the states. It was quite the eye opener but her novels usually are. I haven't seen the cardinal but I can hear it in my back yard right now. 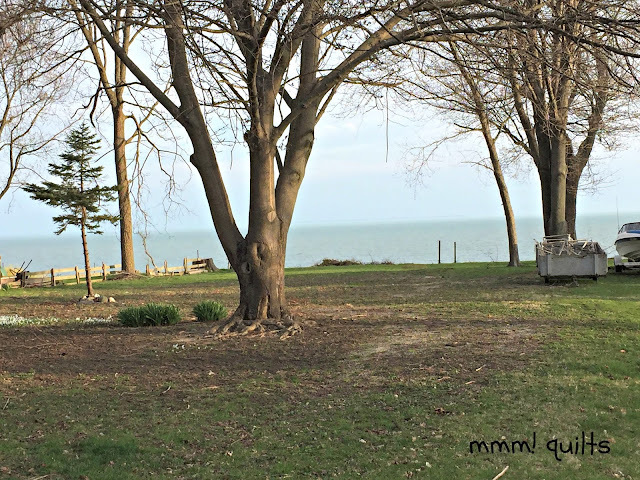 Spring seems to be taking it's time here, just that much farther from the lake. I'm glad you made bright blocks for the seniors quilts they'll go with mine! Beautiful blocks. Love the deep shade of red. Fire is so devastating. Couple of years ago a lot of school kids here lost everything in a forest-fire. The blocks you made for Leanne looks lovely! Very thoughtful of your to include both feminine and masculine blocks. The tree looks amazing! Thanks for sharing the Spring photos from your part of the world. Your blocks for Leanne are beautiful, Sandra. And will be greatly appreciated. Lovely signs of spring! 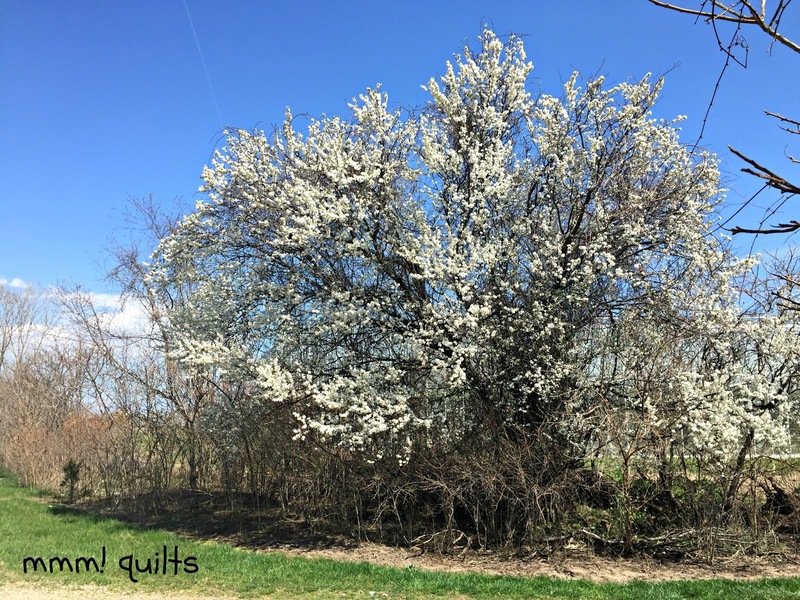 Your spring pictures are lovely, Sandra :) Your blocks for the quilts for the seniors are beautiful too. Thank you so much for helping! Beautiful blocks and beautiful views. I love spring! I have a lot of catching up to do myself and then I got entangled in something else. The square in square blocks will be so appreciated. I see cardinals all the time - frolicking from tree to tree. Oh how I wish to see a glossy ibis or a red-winged blackbird. May you find everything you are looking for.